Filed to: you got subscription fatigue yet?Filed to: you got subscription fatigue yet? you got subscription fatigue yet? 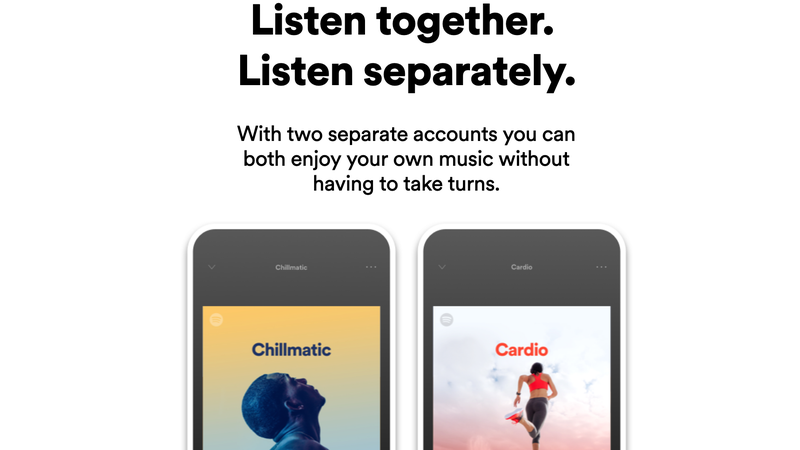 Good news for couples and roomies who don’t hate each other—Spotify is testing a new subscription plan called Premium Duo for two-person households. It’ll go for €12.49 per month, or whatever the equivalent is in local markets, and offers some new playlist features along with it. Right now, Premium Duo is only available in five markets: Columbia, Chile, Denmark, Ireland, and Poland, Spotify told Gizmodo in an email. (Hence, the price in Euros.) Like its family subscription plan, which goes for $15 a month and allows up to six users, both users have to live at the same address to reap the discounted benefits. People who already have a premium subscription can switch plans via their account settings. Spotify declined to confirm when or if it has plans to expand Premium Duo to the U.S., but it’s common for services to test out new features in pilot markets first. One of the new features Spotify is testing out with Premium Duo is a shared, AI-generated playlist called Duo Mix. Basically, it’s similar to Spotify’s Discovery Weekly playlist where you get one mix for both subscribers that supposedly should fit both your tastes. You can change the mood to either “chill” or “upbeat” depending on what sort of tempo you want, and there’ll be little profile icons next to each song to show which one of you is responsible for that clunker in the mix. There’s also an option for shared playlists, which lets you bombard your partner by sharing your entire library. Both subscribers will also get to manage their home settings and the account details from a single page called Duo Hub, Spotify said. The discount itself isn’t a whole lot, especially when you consider that €12.49 is about $14—or roughly the same amount as the Family subscription plan—and an individual Premium account is $10. That said, a couple of dollars does add up over time, especially now that everyone and their mother wants you to sign up for yet another streaming subscription.